keycor -- Musical key identification by correlation. -a Display the r-value correlation scores for all test keys. -D Do not scale notes by their durations when generating note histogram. -G Use raw correlation rather than Pearson correlation. -f Show extracted note histogram of input. -w weightfile Use the weights for pitch profiles in the weightfile. --name Print filenames when printing best key. Keycor is a generalization of the key-finding algorithm used in the Humdrum toolkit program key. While key is limited to a fixed set of key-weightings, keycor has a selection of 5 preset weightings, plus the ability for users of the program to provide their own set of weightings. Pearson correlation is used by the program to identify the best key. Correlation takes two sequences and calculates a value between -1.0 and +1.0. An absolute correlation value near zero indicates a poor match, while a value of +1.0 indicates a good match. Using the Krumhansl-Schmuckler algorithm, Pearson correlation values are calculated between a histogram of the twelve-tone pitch-classes in a musical sample and each of the 24 major and minor key profiles. Here is the mathematical definition of Pearson correlation: x is a histogram of pitch-classes extracted from a musical score. y is a list of the weighting values for each twelve-tone scale degree in a particular key. x-bar and y-bar are the average value for each input. 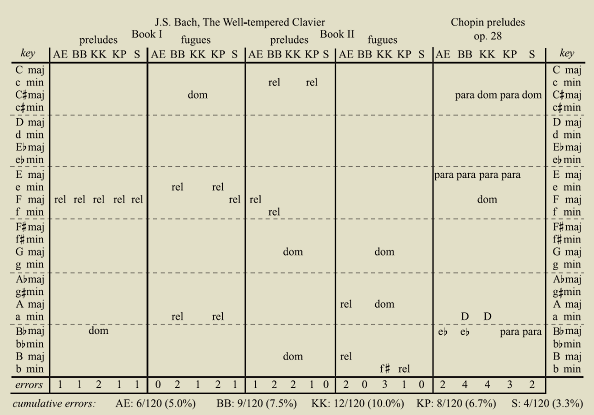 Beneath the music is a list of the twelve pitch-classes present in the example, along with a count of how many eighth-notes worth of duration for each pitch class. Therefore the first input list to the correlation calculation is: (8, 0, 0, 0, 2, 11, 0, 5, 7, 0, 5, 2). The second input into the correlation calculation is a list of weightings for the major/minor key being compared to. For example, using the simple weight set below the second input would be: (2, 0, 1, 0, 1, 1, 0, 2, 0, 1, 0, 1). And the resulting correlation value is 0.35. For the above musical example, the highest correlation corresponds to F minor, which generates a correlation of 0.79. By default keycor uses the same weightings as key. These weightings are the experimentally-derived probe-tone ratings of Krumhansl and Kessler (listed below). The above table of calculations and search for the key which yeilds the maximum correlation value can be expressed mathematically in the following equation for the Krumhansl-Schmuckler key-finding algorithm: where x is the pitch-class histogram, yk is a particular scale-degree weighting set for a particular key, and k is an index over all 24 major and minor keys being tested. The Krumhansl-Schmuckler key-finding algorithm is similar to an earlier algorithm developed in the 1960's by James Gabura which can be calculated instead if you specify the -G option: In this algorithm, the histograms and key weightings are not normalized before doing a dot product between the two input vectors. This will tend to cause problems in choosing between the best key in different modes (so it is more difficult to choose whether the best major or the best minor key is the overal-best answer). The similarity between the two algorithms can be seen by expressing the Krumhansl-Schmuckler algorithm in terms of z-scores: where N is the number of pitch-classes (12), zp is the z-score version of the sequence p.
Here is a plot showing the relative weights of each scale-degree in the above five key-weighting sets. 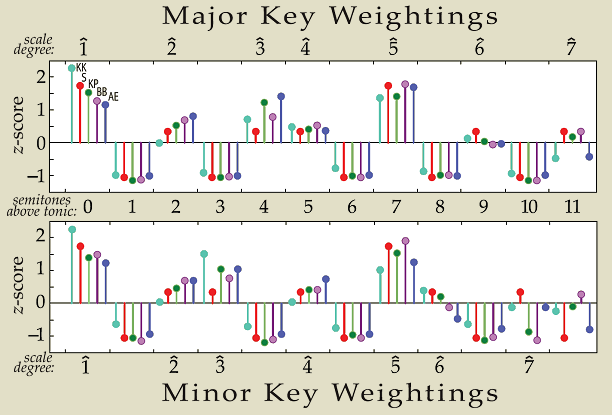 Major keys weights are shown in the top plot, and minor key weights in the bottom plot. The weights are normalized for direct comparison so that their standard deviation is 1 and the mean is 0 (which is what happens to the sequence when pearson correlation is used). KK (light blue) = Krumhansl-Kessler weights; S (red) = simple; KP (green) = Temperley-Kostka-Payne; BB (purple) = Bellman-Budge; AE (dark blue) = Aarden-Essen. Weightings between the various sets are about the same for scale-degrees outside of the scale (particularly in the major scale). The Krumhansl-Kessler weights have the strongest weighting for the tonic in both major and minor keys. This causes these weightings to confuse the tonic and dominant more often than other weight sets. The sixth scale degree in major scales for all weight sets is mostly ignored. Strong tendancy to identify the dominant key as the tonic. Weak tendancy to identify the subdominant key as the tonic. No particular tendancies for confusions with neighboring keys. Strong tendancy to identify the relative major as the tonic in minor keys. Well-balanced for major keys. Performs most consistently with large regions of music, becomes noiser with smaller regions of music. The following table lists key-identification errors for five sets of key-profile weights. Each column represents a set of 24 compositions in all of the major and minor keys. 96 compositions from the Well-tempered Clavier, Books I & II by Johann Sebastian Bach, and 24 preludes, Op. 28 by Frédéric Chopin. Only errors are noted in the table, with blank cells indicating that the correct key was identified by the correlation algorithm using the specified key-profile weights. rel is a modal error where the relative major or minor key is identified instead of the correct key. 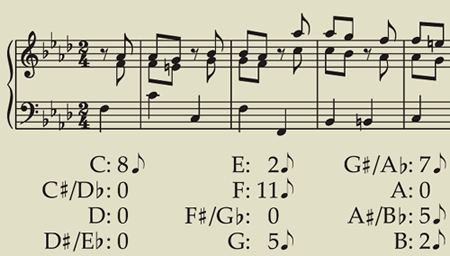 For example, if the correct key is A minor, and there is a rel label in the table, then that means that C major was identified by correlation rather than A minor. dom indicates that the dominant key was identified by the algorithm rather than the correct key. para -- the parallel key was identified rather than the correct key. For example C minor is the parallel minor key to C major and vice-versa. Other more distant keys which are identified as the key rather than the correct key are labeled explicitly (5 cases). Example usages of the keycor program are available on the keycor examples page. Aarden, Bret. Dynamic Melodic Expectancy. Ph.D. dissertation. School of Music, Ohio State University; 2003. Bellman, Héctor. "About the determination of key of a musical excerpt" in Proceedings of Computer Music Modeling and Retrieval (CMMR): Pisa, Italy; 2005. pp. 187-203. Gabura, James A. "Music style analysis by computer" in Lincoln, Harry B., ed., The Computer and Music. Cornell University Press: Ithaca, New York; 1970. Krumhansl, Carol. Cognitive Foundations of Musical Pitch. Oxford Psychology Series No. 17. Oxford University Press: New York; 1990. pp. 37, 81-96. Sapp, Craig Stuart. "Key-Profile Comparisons in Key-Finding by Correlation." International Conference on Music Perception and Cognition (ICMPC 10); 2008, Sapporo, Japan. Temperley, David. Music and Probability. MIT Press: Cambridge, Mass. ; 2007. p. 85. The source code for the program was last modified on 21 Apr 2013. Click here to go to the full source-code download page.